Digit is a mobile app that automates saving. If you struggle to save, Digit is a way to build up a nest-egg without thinking. And if you’re wondering if it works, users saved over half a billion dollars in just its first few years since launching. With Digit, you won’t need to pull out a pen and paper some Sunday afternoon, craft a budget, and diligently set a savings schedule. And you shouldn’t find yourself going off-track either after a few weeks, because Digit is always working on your behalf to squirrel away a few nuts regularly. Think of Digit as a microsavings mobile app. Every day your spending and income habits are monitored. And after analyzing how much you can save, Digit moves an affordable amount from your checking account to your Digit account. Over time, those little amounts grow to become a much larger nest-egg you can enjoy without the hassle of needing to budget and save yourself. Digit costs $2.99 per month, which is more than Acorns, but if you think about it as paying the price of a cup of coffee each month to not have to think about your savings habits, it’s a pretty good deal. Plus, you earn interest on your savings so above a certain threshold, the interest offsets the monthly cost, and the app is effectively pays for itself. Is Digit Worth The Cost? How Does Digit Compare To Qapital & Acorns? Is Your Money & Information Safe At Digit? It is simple to get started with Digit. The first step is to connect your bank account to the mobile app so your income and spending habits can be analyzed. No really, that’s it. After you connect your bank account, Digit does the rest. Every day, Digit strives to move some money from your checking account to your Digit account. Only money you can afford is moved, so you don’t have to worry about an overdraft. In fact, Digit provides a no-overdraft guarantee. According to Digit, the average user saves between $80 and $170 monthly. Some daily transfers can be as low as a few dollars but we found the average daily transfer amount to be just under $10. And if you want to access your money at any time for any reason, such as paying for an upcoming vacation or a new car, you can do so easily at no cost. Simply make a withdrawal request and Digit transfers money back to your bank account the next day. If you are ever curious how much Digit is moving from one day to the next, you just need to ask it. You can message Digit a query, such as “what did you do for me today?” or simply write “today” and Digit will respond to let you know how much was saved – or if nothing was saved, it will tell you why. A nice bonus Digit throws in is that when you save for 3 consecutive months, you automatically earn a 1% annualized savings bonus. Although Digit charges a monthly fee to automate your savings, it also pays you annualized interest of 1% on account balances. Based on the $2.99 monthly fee, the breakeven level where interest payments offset the monthly cost is approximately $3,600. For balances north of $3,600, Digit is a clear win. Unlike some other microsavings apps that charge a % of assets, which means you pay more in fees as you deposit more, Digit keeps fees flat even as you deposit more. When you consider the alternatives available to Digit, we think the monthly fee is quite reasonable. Digit could have sold customer data to advertisers or pitched credit cards, but it chose instead to charge for its service directly to help consumers avoid the headache and hassle of thinking about daily saving habits. Rival microsavings apps, Acorns and Qapital, take slightly different approaches to automated saving. Qapital is a mobile banking app that provides you a bank checking account, e-checks, and a Qapital Visa Card. Each time you swipe your card, Qapital takes a cut. Qapital is more hands-on than Digit because you need to create “Rules” that trigger savings. For example, you could set a Rule whereby each time you visit the gym, $10 is deposited into your Goal account at Qapital which you can allocate towards a specific financial goal, such as buying a new car. Acorns is the big gorilla in the microsavings space with over 1.7 million customers. The way Acorns works is each time you buy something with your credit or debit card (linked to your Acorns account), the amount is rounded up to the nearest dollar, and the spare change is invested. Acorns charges $1 monthly for balances under $5,000 and 0.25% of assets for amounts of $5,000 and above. Another factor to consider at Acorns is your comfort level with stock market swings because at Acorns your savings are invested across six asset classes and are subject to the ups and downs of financial markets. Any monies deposited at Digit are FDIC insured up to $250,000. And as you might expect, Digit commits to anonymizing your personal information, encrypting it and storing it safely. Over 2,500 U.S. banks and credit unions are in Digit’s network, so no matter who you currently bank with the chances are high that Digit is available to you. 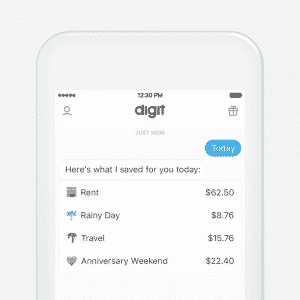 Digit gets two thumbs up on making saving about as easy as it gets. No minimum balance is imposed and transfers are free. Plus you get $5 to sign-up! Where Digit loses some brownie points is a higher monthly fee than some other money-saving apps, though interest payments can offset the cost above a certain threshold. ✅ Flat Rate Fee: Digit charges more than some rivals but also pays a guaranteed 1% annual interest rate on deposits, so above $3,600 in account balances, Digit essentially pays for itself. ❌ Microsavings Not Investments: Unlike robo-advisors which are designed to grow your money over time to build a nest-egg for retirement, Digit is simply designed to help you pay for an upcoming financial goal by building a cash account that earns a little interest. It’s unlikely you can build up enough savings to get rich with Digit, but you can squirrel away a few more nuts than usual. ✅ Automated Savings: Digit is perhaps the simplest of all microsavings apps because once you connect your bank account to your Digit account, you can be completely hands-off – whereas some other moneysaving apps require you to set rules, triggers and goals. ❌ Uncertain Deposit Amounts: It’s not clear how much will be transferred each day from your bank account to your Digit account. We found the average amount to be under $10 but some days it crept up above that and for each person it’s likely to be different. If the uncertainty in how much is transferred daily makes you queasy then Qapital might be a better choice where you have more control. ✅ Daily Saving: Digit analyzes your income and spending habits each day and saves a little bit whenever possible virtually unnoticed, so you can grow your nest-egg effortlessly. ❌ Mobile Only: The app is designed for mobile activity, so you will be disappointed if you try to transfer funds online via a web-based interface. ✅ Zero Account Balance Requirement: No minimum balance is required to get started with Digit. ❌ Monthly Fee: Above account balances of $3,600, the $2.99 monthly cost is offset by interest payments so compared to Acorns, Digit is attractive for higher balances but those with less than $3,600 may be better off at Qapital. ✅ Unlimited Free Transfers: Transfers from your checking account to your Digit account are free and it’s easy to make withdrawals if you need them – funds are transferred to you the next business day. ✅ Get $5 At Signup: When you sign-up to Digit, you receive a $5 sign-up bonus. Digit costs a few dollars a month and pays interest of 1% on deposits so the breakeven account balance to entirely offset fees is $3,600. Transfers to your Digit account are free and you get a bonus for regularly saving. Both iPhones and Android phones are supported. Digit is one of the best money-savings apps to help you automatically squirrel away a few nuts daily without hardly noticing. After you link Digit to your bank account, Digit does the rest, so unlike some other mobile apps that require you to pick how much to save, Digit requires no input from you and handles the process from start to finish. Although the low monthly cost of $2.99 is higher than some other apps, Digit helps to offset that cost by paying interest on account balances. Once you reach $3,600 in savings, the interest entirely offsets the cost of the app. If you prefer to allocate your savings to the stock market and can tolerate the ups and downs of an investment account, Acorns or Stash will be better choices. 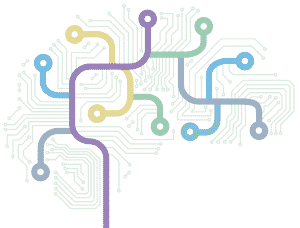 The bottom line is if you struggle to save and like the idea of an automated savings approach that operates virtually unnoticed to build up a nest-egg for you, Digit is a great choice. ‹ What Are The 7 Best Robo Advisors?